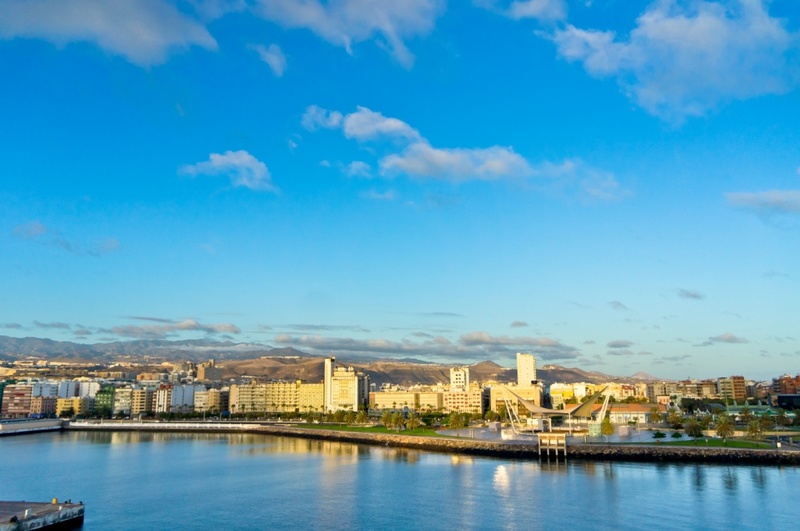 Las Palmas de Gran Canaria is the heart of the island. It's the place of arrivals and departures, of beginnings and endings and of endless days of sunshine. A city as diverse as magic whether day or night. The city is full of surprises, life and color. Not only has it one of the best urban beaches of the country but it is also known for its marine life and biosphere reserve. The capital has two different areas: the historical and the port area with the beach of Las Canteras, and not to forget the uptown area. In both, the car is not necessary. For nearly 400 years, Las Palmas de Gran Canaria was limited to the old walls of Vegueta-Triana. In Vegueta, it is recommended to start on the Plaza of Santa Ana, the Cathedral and the Bishop's Palace. Then, the journey continues to the Casa Museo de Colón, which commemorates the visit of the explorer Christopher Columbus on his voyage to America. Here you'll also find the Centro Atlántico de Arte Moderno, the baroque church of San Francisco de Borja and the Museo Canario. The Triana distric was born shortly after the founding of the city. Here you'll find the popularly known Plaza of 'Las Ranas', the Casa Museo Pérez Galdós and the first theater of the island with the same name. Heading north, you'll reach the park in San Telmo. Here, the central bus station is located, where you can catch a bus to go to different parts of the island outside the capital. Triana is one of the most important outdoors commercial areas of Las Palmas de Gran Canaria together with Avenida Mesa y López. In Parque Doramas, you'll find the the Hotel Santa Catalina and Pueblo Canario where you can explore craft shops and various folk performances that are held every Sunday morning. In the capital you can find different beaches: Las Canteras, Las Alcaravaneras, San Cristóbal, La laja y el Confital. The walk along the beach of Las Canteras, offers numerous terraces to spend some quiet hours. The beach with over four miles of golden sand is protected by a natural reef known as the 'bar'. It's an over 100,000 year old limestone reef and a valuable natural breakwater, providing calm waters in most parts, except for days of high tide . Some of the activities that can be practiced in Las Canteras are Beach Soccer, Beach Volleyball, Beach Rugby, Beach Paddle, Thai Chi, walking, or simply taking a stroll to admire the scenery. Among the sea activities, surfing, wind surfing, kite surfing, swimming, remo, and all engine activities are among the favourites. Each activity is assigned to a specific 'zone', so that everyone can enjoy their favorite sport without upsets or incidents. In the extreme northwest of Las Canteras is the Audtorio Alfredo Kraus, an exponent of modern architectural avant-garde art. Find information about selected Hotels, apartments and rooms in Las Palmas de Gran Canaria to choose the perfect place for your accommodation.